When you go on holiday, you want your taste buds to enjoy themselves just as much as you do. Trying local dishes is an important part of the travelling experience no matter where you are, so if you’re journeying to Gran Canaria for your next break, be sure to order some of these dishes for an authentic taste of the island. But first, some geography. Gran Canaria is part of the Canary Islands – a Spanish archipelago. It is also a highly popular tourist destination – thousands of Brits book flights to Gran Canaria every year. Both of these facts guarantee that the food in Gran Canaria is quite excellent wherever you go. Don’t miss out on these particular treats as you’re unlikely to find them anywhere else at the same quality. It’s the one that everybody tries when they’re on the Canary Islands – make sure you’re not left out. Papas arrugadas is Spanish for wrinkly potatoes, and that’s exactly what these are. Boiled in sea water, the vegetables develop a thin layer of salt before they are stuffed and covered in a spicy sauce of garlic, vinegar, cumin and olive oil. Delicious. Often served on Sundays in a tradition similar to the roast dinner in Britain, this festival dish is a stew consisting of salted cod and sweet potato. It’s often found in South America, but if you order it on the Canaries, you’ll be safe in the knowledge that you’re consuming the original recipe, as it was first cooked up here. 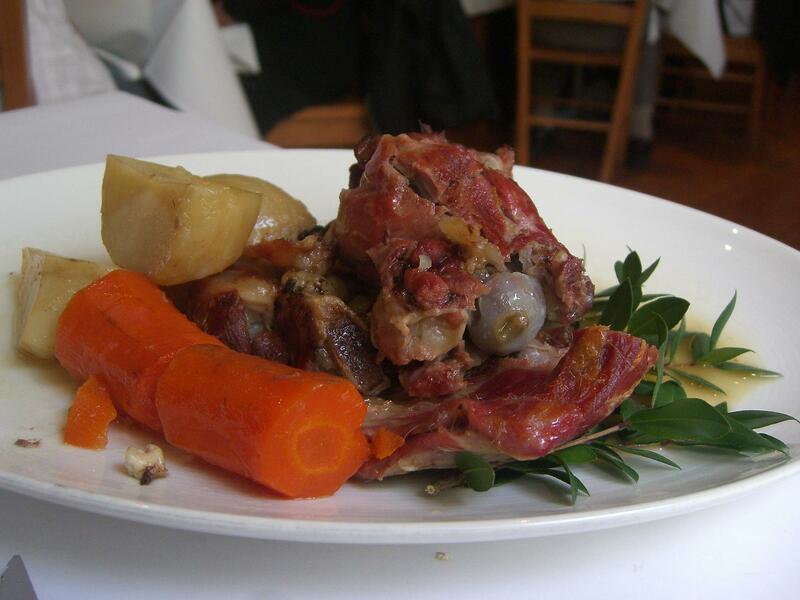 If you’re feeling adventurous, try ordering this goat meat dish. Be warned – it has a very strong taste, but the Canarian method of stewing it makes it beautifully succulent and very delicious. It is often served in huge portions, so make sure you’re hungry enough! No matter where you stay in Gran Canaria, you’re never far from the sea. The restaurants on the island utilise the ocean’s bounty as best they can, plucking octopuses and squid straight from its waves and usually cooking them the same day. Squid is generally cut into rings and fried with lemon, while an octopus dish will usually be sprinkled with sea salt and paprika. Either way, they’re delicious. As well as bountiful sea waters, Gran Canaria is blessed with fertile lands that produce excellent fruit and veg, thanks in part to its subtropical climate. Mangos, papayas, pineapples, watermelons and bananas are among the tasty treats you can expect, and you’ll be safe in the knowledge they were picked close to where you purchased them from by local farmers. If you’ve got a sweet tooth, you’re in for a treat. Gran Canaria restaurants often list plenty of dishes to appease the sugar craving, with the most traditional being truchas de batata – a turnover-like meal filled with sweet potato. Huevos mole is a thick custard flavoured with lemon peel and cinnamon, served with many of the desserts. Mazapan – a dense shortcake made from almond flour – also comes highly recommended, but always ask if your dessert is homemade to avoid disappointment. Travelers on a culinary voyage of discovery across Europe should be sure to include Gran Canaria on their itinerary. In addition to fine beaches and amazing sights, the food will lull you into a state of bliss that will keep you here longer than you’ve planned!